Art & Light believes not only in the talent of the artists that we represent regularly, but the talent of those creatives outside of our current roster as well. The work of Michelle Jardines has caught our eye and we are thrilled to bring to you her very first exhibition with A&L Gallery! Partnering with veteran talent, Annalisa Fink, our newest exhibition entitled, “Transcendence + Imminence,” pulls together the vastness of space in Michelle’s work to the detailed flora of Annalisa’s. Michelle Jardines is a first generation Cuban-American who has emerged in the wake of the influence of Gerhard Richter and J.M.W Turner. Her Cuban heritage has led her to focus on abstract realism and abstract expressionism that are continuously evolving through her life experiences. Through the expressive brush strokes, unique use of her palette knife and various blending techniques, she alters and creates compelling and memorable paintings with bold colors and dramatic compositions. Jardines explores the spiritual fragility of her surrounding environment and human emotion in her oil paintings on canvas. Please join us for the unveiling of her latest collection in a joint exhibition with Annalisa Fink - “Transcendence + Imminence” - opening THIS FRIDAY, April 5th from 6pm- 8pm. Annalisa Fink is one of those souls that you meet and immediately feel connected to. Her sweet spirit shines through when talking about her family, her art and of course Mr. Brict, her furry studio-mate. We often connect her work to our hikes at Paris Mountain and Pisgah National Forest with their shadows and playful light. Read below for a look into Annalisa’s paintings in her own words. As an A&L Gallery staple, we are thrilled to introduce a brand new body of Annalisa’s work alongside guest artist, Michelle Jardines, in a joint show entitled, “Imminence + Transcendence,” opening Friday April 5th, 2019. Join us to celebrate on April 5th from 6pm - 8pm. It has been three years since Bethany Mabee did her first pop up with us and we have been excited to bring her back ever since. Her intuitive abstract paintings come to life through layer, color choice and a few happy accidents. Having spent years in the interior design industry, Bethany saw first hand how art really can help transform a space and it encouraged her to focus on her painting which gained her gallery representation and articles in multiple publications. Read below to learn a bit more about Bethany and her latest collection made especially for Art & Light Gallery, Fluid & Fixed. “In-Progress” shot of Mabee’s studio in Illinois. Please join us this Friday , March 8th and Saturday, March 9th for a special pop up event featuring the latest collection from Bethany Mabee. Works are currently available for pre-sale here and will available in the gallery during the two-day pop up event! If you are interested in meeting Bethany, stop by the gallery on Saturday from 10am - 4pm for an artist meet and greet. When two creative minds come together, the result is nothing short of spectacular. 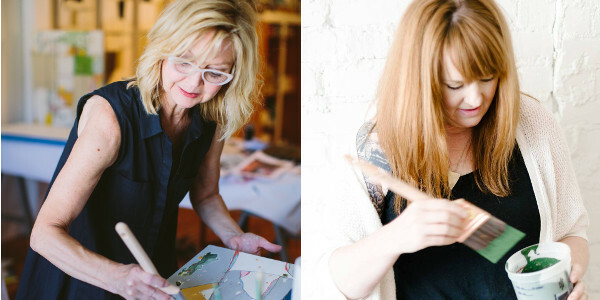 A&L’s very own Teresa Roche and Barb Blair of Knack Studios have joined forces in a collaboration that connects the dots between art, design and everyday living. Longtime friends and creative forces in the Greenville community, Roche and Blair are thrilled to present “Rejoice”, a design focused exhibit combining Roche’s original paintings and Blair’s restored furniture pieces. Teresa Roche’s current work is related to capturing the spirit of a memory or a place. Largely inspired by everyday interactions with her grandchildren, Roche has unveiled a playful approach in her latest paintings. Pops of neon weave among lively patterns, hinting at make-believe stories and Utopian destinations. With careful prep work, thoughtful design and original features like unique knobs, Barb Blair transforms furniture into works of art. Blair swears that wallpaper makes her a better artist, and uses decoupage techniques to create points of visual interest within her “story pieces.” Roche’s original paintings have come to life in the form of wallpaper and fabrics, and are featured in Blair’s latest restored furniture pieces. Roche and Blair in their elements. Art makes the space...and we are here to help! Here, this Kiah Bellows is the finishing touch to an impeccably designed space by Chisana Hice-Smith at In Site Desgins. Private Collection, Greenville, SC. At Art & Light, we believe that art is the thing that gives a space life. It compliments the other things around it to make a room feel intentional. Whether art is the finishing touch or the anchor in the design from the start, we are here to help you find that perfect piece. We are more than just a gallery with art hanging on the walls. We are an experienced staff with more than 12 years of consultant experience and trained eyes. We can help you refine your taste and introduce you to both local and international artists of all levels. Here you see the work of Eric Benjamin and Shellie Lewis in a private collectors home. We worked on many levels to find the perfect works for this space and our collector. When you begin your art collecting journey, we advise you and/or your designer to come into the gallery and see first hand the incredible talent that we represent and to see what styles you connect with. From here, we begin a more in depth dialogue to really hone in on what works for you and your space. Whether this is work currently in the gallery, works we have access to in our artists’ studios or personal commissions, we are here to help find the perfect piece for your home or office. If you are an art-lover, museum goer, collector, student or educator, we are here to help you discover and learn more about collecting art. To see some of our projects and meet a couple of designers we work closely with, click here and if you are ready to add original art to your life and need a hand, give us a shout by clicking here. An Annie Koelle Landscape give this room warmth. Commissioned for this space by Chisana Hice-Smith with In Site Designs for a private collector. You know her for her constant presence in the Greenville art-scene, owner of Art Bomb Studios, as well as her collectible and elegant birds painted on wooden blocks. Diane Kilgore Condon is an incredible talent whose paintings have, in her own words, been forming for more than 40 years. We are thrilled to represent Diane’s work on a regular basis and even more excited to welcome her back for a solo exhibition starting this Friday, February 1st which runs through February 23rd. Please join us on opening day from 6pm - 8pm for a reception honoring the artist. It will be the perfect time to enjoy and collect from Diane’s most recent collection. Magill Oliver putting the finishing touches on a piece for the show. We are honored to welcome in the new year with a brand new body of work from the talented Eva Magill Oliver. “Becoming” is a body of work that has been inspired by the relationship between the artist and the materials used. Magill Oliver believes that though the artist is guiding the creation, the materials often react in unforeseen ways and the beauty in that unexpected should be embraced. The natural world is an ever-present theme in Magill Oliver’s work and is also transitional based on the landscape that surrounds her. It inspires her color palettes, the way she creates patterns, and influences the organic shapes and silhouettes prevalent throughout her work. "I love to explore the movements, patterns, and connections found in the natural world. I am in awe of nature's subtle variations and how they flow and influence one another." Eva is represented by a number of galleries nationally and has worked with international brands such as Anthropologie, AG Jeans and Silvie Thiriez of France. Most recently, she published a book entitled, “Paint Alchemy” which explores process-driven techniques through design, pattern, color and more. Books will be available here in the gallery for the duration of the show. Please join us this coming Friday, January 11th for an art party celebrating the artist and her exceptional new body of work from 6 - 8pm. “Becoming” will be available for viewing from January 11th - January 26th during our regular gallery hours. If you would like additional images and details on the show, please reach out to us by clicking here. When art meets design meets daily use - you have a winning combination. For our special multi-artist pop up this coming weekend, we are thrilled to bring you the artful works of Teresa Roche, Keiko Kamata and Marijana Mijacevic. Each of these artists with a background in textiles, fine art or design - offering artisan goods beautifully made and carefully considered. Selling thoughtful and beautiful things. The collection of all three is curated to showcase home furnishings that blend together in natural/organic ways in hopes of reaching an appreciative and artful audience. Keiko Kamata is no stranger to A&L - she is a Japanese printmaker who moved to Greenville eight years ago and has done several shows, as well as several Pop-Ups. She’s supremely talented and has taken the last year to turn some of her amazing prints into wallcovering and fabric designs. Keiko’s love for Mid-century modern, fascination with Scandinavian lifestyle, and ingrained Zen minimalism inform her designs. She creates simple yet engaging patterns to make everyday surroundings and activities special. The Pop-Up will include wallpaper and fabric, as well as birchwood trays handmade in Sweden. Marijana Mijacevic is also no stranger to many of you as she has been popping up in some of Greenville’s finest festivals, including the Maker’s Summit’s Indie Craft Parade - Marijana’s home furnishing line, Kuća, meaning “home” in Bosnian, was founded on the idea of making simple items that are also beautiful. Her product line makes up home items that strike a balance between nature and the modern world including pillows, table linens, aprons and totes. Teresa Roche, our fearless leader here at Art & Light Gallery and fabulous artist has taken a special selection of her highly-sought after original paintings and turned them into wallpaper and fabric. Custom pillows can be ordered through the gallery as well as yardage of her fabric and wallpaper in three different lengths. We are thrilled to host these three talents alongside Twenty Two West this coming Friday evening during our Cocktail Crawl Friday evening from 5pm - 7pm and again Saturday from 10am - 4pm where you can actually meet the creators and chat with them about their process. This coming Friday evening from 5-7 and Saturday 10 - 4, we are excited to have long-time gallery friend, Mary Hamby, back in the gallery with her incredible handmade and artful jewelry for a one-day pop up. In addition to the jewelry you know and love, Hamby will be bringing her gorgeous woven blocks and a few beginners loom kits. Any of these would make a fabulous and unique gift for that artsy in your life. Read below and watch the video above to learn a bit more about Hamby’s goal and process with Twenty Two West. “I am a full time artist working out of my studio in Charlotte, North Carolina. The name of my business, Twenty Two West, comes from a place that inspires me - the address of the home where I grew up in Greenville, South Carolina. My goal is to combine nostalgic roots with modern designs in each of my handmade pieces. I use the classic techniques of weaving, ceramics, and woodworking to create wearable art and to build approachable sculptures that suit the modern home. Works will be available in-store during our Holiday Cocktail Crawl Friday evening from 5pm - 7pm and Saturday from 10am - 4pm. If you are not local and are interested in anything, please send us a message or give the gallery a ring during regular gallery hours.